Our vision at DASD is committed to a culture that honors knowledge, respects individuals, demands excellence, fosters life-long learning, and supports relationships that strengthen individuals, families and community. Here at DASD, every student, staff, and family is a valued member of our community. We are proud to be home to a beautifully diverse population of students, families, and staff of different races, faiths, national origins, immigration status, abilities, sexual orientation and gender identity. We are a nonpartisan school district that values and celebrates diversity. LOCATION: The DeForest area is situated 10 miles northeast of Madison. Hwy. I-90-94/39 runs along the west side of the area, Hwy. 19 to the south, and Hwy. 51 in the central/east area. 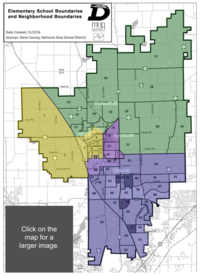 The DeForest Area School District serves a diverse citizenry in the Northeast quadrant of Dane County. The majority of our 3,783 students reside in the rural-suburban communities of DeForest and Windsor, though the District serves portions of seven other municipalities in a 100-square mile area. The other communities include Hampden, Leeds, Bristol, Burke, Vienna and portions of Madison and Sun Prairie. DASD is particularly proud that . . .